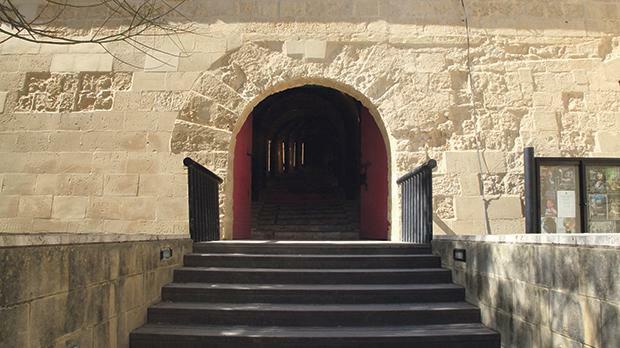 When the knights built the city of Valletta, they were ingenious in their design. Not wanting to ever again suffer the trauma of a siege like the one of 1565, they fashioned the new city in such a meticulous manner, so that any potential future enemy was put off with one mere look at its OCD-like planning. Take the city gate. The entrance is flanked by two huge, fort-like structures – cavaliers – which stand over it like twin knights guarding it. The cavaliers of St James and St John were built simply with one purpose in mind: to make the city impenetrable. The message was glaring – try scaling these walls, try walking over that bridge, and you’ll be no more: finito, sausage. By their very presence, the cavaliers said: our men will be manning the walls on those cavaliers and they’ll be ready for you with arrows, swords, pots of boiling oil, tar, pick your choice. It was enough to make war tents in the East shudder with fear, and in fact the glorious cavaliers were never used, except, I would imagine for some show of force parades organised by the knights. Over the centuries, the hulking cavaliers, in particular the one next to Auberge de Castille fell into disuse. Until that is, the dawn of the millennium. You may remember how everyone around the world was scrambling to come up with ideas to mark the new noughts. I distinctly remember the UK’s millennium dome, the enormous dome built purposely to house a permanent exhibition about the upcoming Third Millennium. No one really turned up for the exhibition, except myself and probably another 10 nerds. Lucky for Malta, our millennium project was more soulful, more tangible, more needed. St James Cavalier, then a quasi-abandoned building, was lovingly and beautifully restored and converted into a national art centre for creativity, a mesmerising space for art exhibitions, a small Indy cinema and a vibrant café. We had never had anything of the sort on the island before: a fertile ground for artists to produce new work and find new meeting points with audiences. For years after its opening, St James Cavalier was the place for a catch-up with a friend, for productive brainstorming or for some me-time – it was perfect to dip in and out at break times to check out whatever new exhibition was on. It was the perfect place, a few years later, from where to watch Malta’s EU ascension ceremony on a big screen, and where there was a collective burst cheering and whooping as the signatures were signed. It was the place where you could go, walk around and spot something – maybe a painting, maybe a photo, or a piece of pottery – and you go ‘oh!’ just like when you see a butterfly flutter in a garden, and then you happily carry the moment with you through the day. Later, when I had my daughter, I used to send her to the children’s summer school there, and she used to absolutely love running, singing, and smudgy-painting in that historical building, breathing and living the same space that the knights did hundreds of years before. Then, things started changing. One summer we were told that the summer school would be no more. That the air-conditioning system needed an overhaul. That they needed to close here and there. And then bit by bit, we started realising, from the dangling wires on walls, from the smell of mould in the downstairs area, the pride-less look on the faces of the staff, that St James Cavalier was no longer being given any tender loving care. Fast forward to 2018, the year Valletta is the European City of Culture. Is St James Cavalier, the main art centre of the island, starring as a main feature? No. The Cavalier feels like it has allowed the enemies of culture to scale its walls and take over. The place is hollow, dead, smelling of stale left-over food for cats. It has become the place where butterflies come to die. There are still some beautiful exhibitions set up there – I recently popped in to see the heart-wrenching installation of young budding artist Matthew Schembri – but each creation now stands alone, bereft of a context, in a soulless space that now celebrates the filling in of administration forms over creative chats in the coffee shop. St James Cavalier has become a building, stripped off even of its name. We are now asked to call it Spazju Kreattiv and I suspect that there is someone employed to sit at a desk and every week coin up ridiculous names for the different areas inside the building (‘mkejjen’ made me giggle), and then come up with boxy logos featuring the letter ‘K’. We are witnessing the slow death of the national centre for creativity. But let’s be aware of what we are killing here – we are putting the knife in the very place which helps society look introspectively at itself and its mindset. We are killing our own self-knowledge and understanding. Without a creative voice, a society is only one step away of becoming dead inside, and a society which is creatively dead is one which is repressed. We are now left with the Infiorata’s pointless flower carpets and Il-Festa l-Kbira with its jigging church statues, and a V-18 chairman who has become the shame of Europe. One look at the state of our culture is enough to show the rot that has taken over our society. There is only one solution: we need to find the courage to scale the walls of the Cavalier ourselves, fight away the enemies of culture, and once again fly the national flag of creativity.